The combustion of solid fuels in the automatic boiler burner is a very difficult process, both because of the heterogeneity of the fuel in terms of physical properties e.g. particle size and the variability of physico-chemical parameters relevant for combustion processes. Coal fuel is particularly difficult, whose properties depend not only on the source - the mine, but even the bed from which it is extracted. The process of fuel combustion of coal in automated boilers is a stochastic process. In the known solutions of automatic boilers for solid fuel, fuel dosage, and thus the combustion, is regarded as a continuous process. This means that the feeder works in a regular and repetitive and stationary cycles, and the change in power is held solely by changing the proportion of working time and the stop of the feeder, which in any case does not affect the regularity of repetitions. A disadvantage of the approach to the fuel delivery as a continuous process - and thus the combustion - are huge problems with the draw ratio of fuel and air due to the combustion process, stochastic processes, and that dosages are fed in close time spaces from each other and it is not possible to assess whether the previous dose has been combusted. Significant lengthening the time between supplies always has to involve achieving adequate power of the boiler, with a significant increase in the duration of dosing which causes a momentary loss of incomplete combustion in the form of visible smoke. As a result of combustion in the automatic fuel boiler it has been surprisingly found that the approach to the process of dosage consumption - and thereby combustion - as a pulse (discrete) process allows to assess whether the previous dose has been combusted. Changing the dosage of fuel treatment process - and thereby combustion - not only as a continuous but pulse process is a revolutionary change. Implementation of the new control method is to group repeating cycles of feeding and short stops of the feeder, followed by a long pause allowing the combustion of fuel supplied earlier, and the combustible moment is determined on the basis of the analysis of trends in the exhaust gas temperature. For the ease of operation 5 powers were defined (8 kW, 12 kW, 16 kW, 20 kW and 25 kW) that the boiler can operate. Each has a suitable supply amount of fuel. The user only needs to select the blower speed for their chosen power. 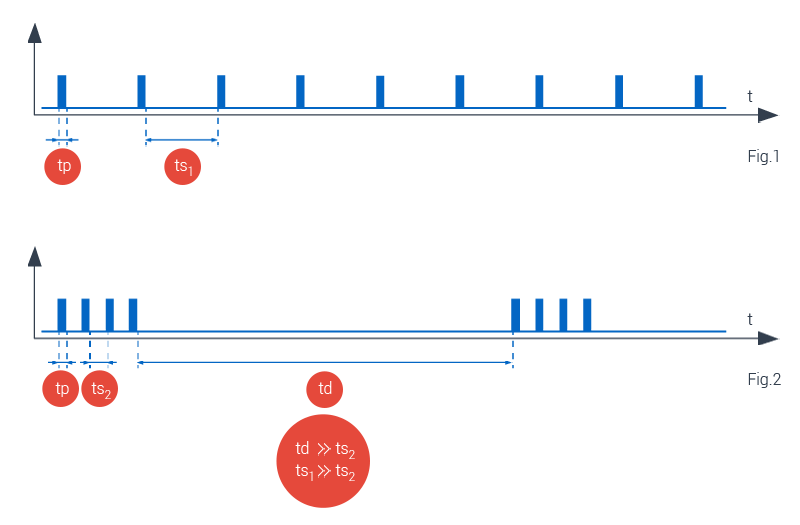 Boiler control algorithm switches between two defined powers (between the minimum and the maximum power) depending on the heat demand. Choice of two (pairs) of the power belongs to the user. If the boiler is to operate with a single power, set the min. and max. power to be the same. Sustain parameters remain standard. The advantage of the new approach is to optimize the combustion of solid fuels for different types of boilers, different tanks and blowers. Histogram is one of the graphical ways of presenting the empirical distribution characteristics. It consists of a series of rectangles positioned on the axis of coordinates. These boxes are, on the one hand determined by the class intervals (see Distribution row) of value characteristics, while their height is determined by the numbers. In our case, the X axis groups downtimes of the feeder with a resolution of 10 sec. The higher the bar, the more times there was a downtime. On the left side of the histogram we have shorter downtimes and on the right side, longer. Downtimes are dependent on the intensity of the blower - the higher the blower speed - the combustion process is faster, the lower the blower speed - the combustion process is slower. 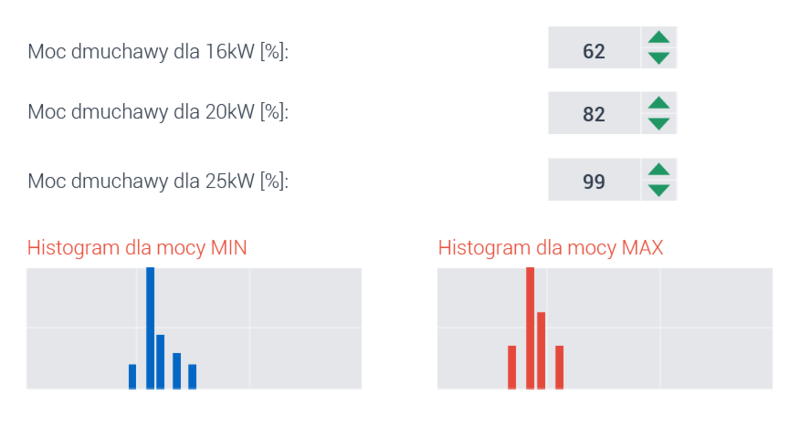 Downtime may be too short - too intense burning (left histogram) and too long - too slow combustion (right side of the histogram). Distribution of the bars in the histogram documents the algorithm of the combustion group. If high bars are at the right side of the histogram, this shows that the algorithm does not detect combustible fuel at the assumed time - it proves too little airflow. The information is to help you set the blower power in the group combustion process.